These Mexican Unfried Ice Cream Balls are a lightened up version of traditional fried ice cream. Enjoy them as a tasty treat without breaking the calorie bank. Happy Cinco de Mayo! As a dietitian, I LOVE seeing all of my colleagues creating recipes to celebrate this festive holiday. Who doesn’t love guacamole, right? As a child, I’ll never forget the first time my parents took me to a Mexican restaurant. After lots of chips, quesadillas, tacos and the like, we were served the most DELICIOUS dessert. I’d never seen or heard of Mexican Fried Ice Cream before, but my goodness, my mind was blown. How did they actually FRY ice cream, I wondered? That was apparently a one-time treat because I don’t recall ever going back to Garcia’s restaurant, though I still can taste that uniquely decadent sweet in my mind. 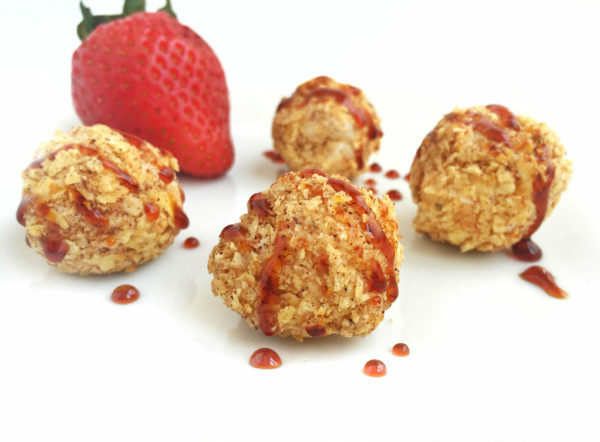 Fast forward many years, I decided to make Mexican Unfried Ice Cream Balls as a way to make a fun, bite-sized dessert that can be served at any summer gathering. The crunchy, salty and sweet flavors create a party on your palate. You can easily make enough for a group, and the kids can help with the crushing and rolling. I’ve made this a few ways, sometimes without syrup and with various toppings. The photos show a drizzle of sorghum syrup, if you’ve never tried it, you can read more about it in my recipe for Roasted Pears with Dried Plums and Pistachios. I also like them with a tiny bit of melted dark chocolate or dipped in frozen strawberries that have been defrosted and pureed. If you are really watching your sugar intake, you can choose to use sugar-free ice cream, though the total calories won’t change significantly. Newer “better-for-you” ice creams are available with higher protein and fiber content, less sugar and lower calorie counts- around 60 per 1/2 cup serving. The nutritional information below was calculated using slow churned ice cream with 100 calories per 1/2 cup. Have fun and get creative with your unfried ice cream! I’d love to hear about any variations you discover in the comments below. Using a small melon baller, form 6 ice cream balls. You can also use a slightly rounded Tablespoon. Place them in the freezer on a plate or small tray lined with parchment paper for a few minutes to firm up. Meanwhile, crush the tortilla chips in a plastic zipper bag with the back of a spoon or rolling pin. Add cinnamon to the bag and shake. One at a time, roll each ice cream ball in the crumbs. You can easily reshape them while in the bag with your hands if the shape needs fixing. Place the balls back in the freezer for a few minutes or until ready to serve. Once plated, drizzle with desired syrup or topping. Adding 1 teaspoon of sorghum syrup or honey will add approximately 20 calories and 4 grams of sugar. Disclosure: Though I am a consultant for the United Sorghum Checkoff Program, this recipe is not part of any contract work and I was not compensated. All opinions are my own. These sound AMAZING! I love a good sweet/savory combo! This is so clever! I love this idea! So creative! What a fun dessert to try.